We’d love your help. Let us know what’s wrong with this preview of Learning Practical Tibetan by Andrew Bloomfield. Whether you are looking for a room, visiting a monastery, or bargaining for a bus seat, Learning Practical Tibetan will make immediate communication with Tibetans easy and fun. This book is designed for anyone wishing to communicate with Tibetans, either in Asia or in the West, and is suitable for beginners as well as for students familiar with the Tibetan language. Learn Whether you are looking for a room, visiting a monastery, or bargaining for a bus seat, Learning Practical Tibetan will make immediate communication with Tibetans easy and fun. This book is designed for anyone wishing to communicate with Tibetans, either in Asia or in the West, and is suitable for beginners as well as for students familiar with the Tibetan language. Learning Practical Tibetan begins with a simple but complete grammar so that you can immediately begin to form your own sentences. 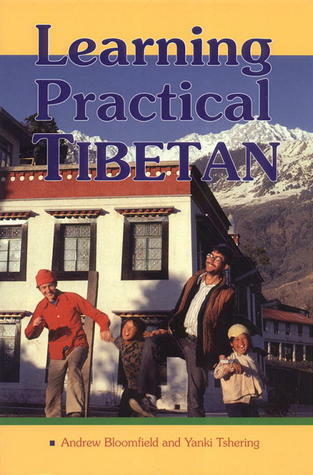 Using both Tibetan script and an easy-to-understand phonetic system, the book then presents useful vocabulary, phrases, and dialogues related to situations you might encounter with Tibetans: eating in restaurants, shopping, speaking to monks, traveling with pilgrims, or visiting a Tibetan doctor. The appendix provides helpful sections on Tibetan numbers, dates, telling time, festivals, religious terms, and an extensive vocabulary list. To ask other readers questions about Learning Practical Tibetan, please sign up. This book is simply wonderful. It offers clear instructions, great vocabulary and pronunciation exercises are available free online. I bought other books in order to learn Tibetan but it was a waste of time. This book is IT!!! Finally, I found this little treasure.